Domino's Pizza: $5.99 Large Pizza ALL Week! Domino’s Pizza: $5.99 Large Pizza ALL Week! Domino’s Pizza Customer Appreciation Week is 10/19-10/25! To celebrate, starting today, October 19th, Domino’s is offering up a large, one-topping pizza with extra cheese for just $5.99-carryout ONLY! This is available at ALL participating Domino’s Pizza stores! The limit of pizza you can get is 256 per household per day, so I think we’ll all be set for pizza this week! 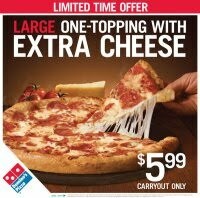 **You check out more details about this promotion on the Domino’s Facebook page.